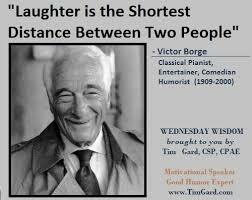 [When I was young in the 1970s I heard a lot about the "great” Danish Comedian Victor Borge. But these days as I study these Jews I always check up on whether famous people are Jews, and time and again you find out the person is a Jew. Rosenbaum was born in Copenhagen, Denmark, into a Jewish family. His parents, Bernhard and Frederikke (Lichtinger) Rosenbaum, were both musicians: his father a violist in the Royal Danish Orchestra,[5a>[6a> and his mother a pianist. [7a> Borge began piano lessons at the age of two, and it was soon apparent that he was a prodigy. He gave his first piano recital when he was eight years old, and in 1918 was awarded a full scholarship at the Royal Danish Academy of Music, studying under Olivo Krause. Later on, he was taught by Victor Schiøler, Liszt‘s student Frederic Lamond, and Busoni‘s pupil Egon Petri. When I read about “tremendous talent” in a Jew I don’t bother taking note of it. This is just a case of Jews pushing their own and overstating everything. Jews shove their way in everywhere claiming great intelligence and talent when often at best it is mediocre. So this “Great Danish Comedian” is really just a JEWISH comedian whom the Jews just shout about and give BIG PUBLICITY using their publicity machine. That’s what they do all the time with their “great authors”, “great scientists”, etc.